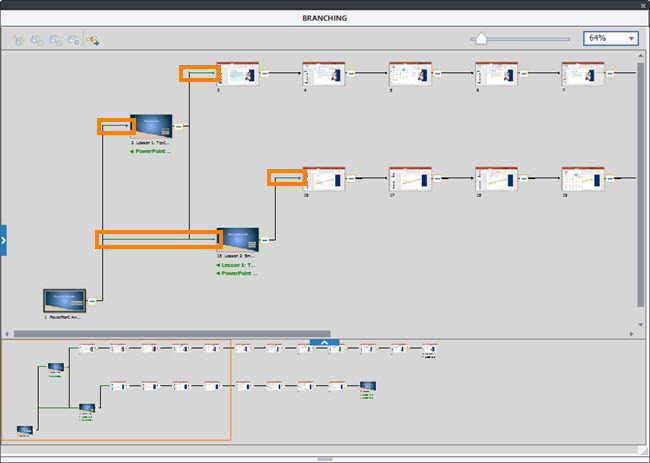 The Branching Panel provides a visual representation of the links between slides and can be useful for modules that let learners jump between modules, or contain progressive question slides where different actions are specified for right and wrong answers. 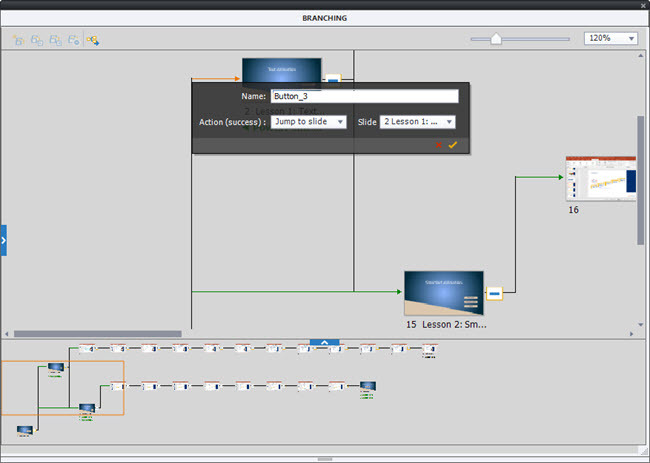 The Branching Panel also lets you create slide groups to organize the Filmstrip, and you can export the Branching View for storyboarding and project management. 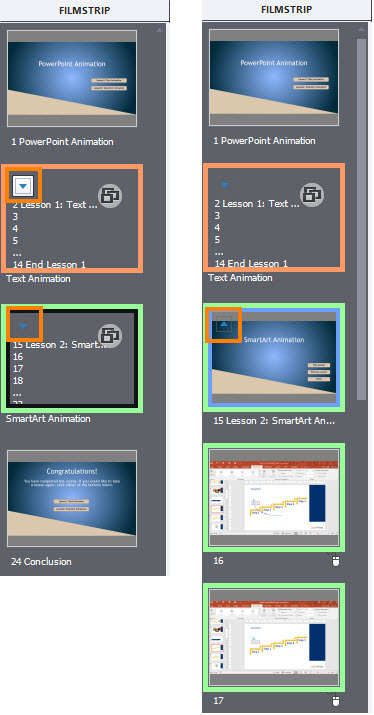 This is a simple two-lesson module where the lesson start slides have been named and feature buttons to jump between lessons. 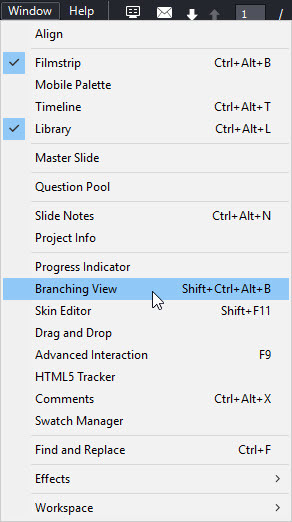 Open the Branching Panel by going to Window > Branching View. The Branching Panel has a Preview Pane that shows all the slides and Main Pane with a zoom control in the upper right. Black lines indicate that the slide from which it originates does not contain interactive objects so after the slide's duration elapses, the next slide appears. Green lines indicate an interactive object on the originating slide linking to the destination slide when the learner clicks. Red lines (not shown) point to destination slides that will appear if the learner fails to interact successfully on the originating slide. When you click a line, a pop-up appears showing the action. 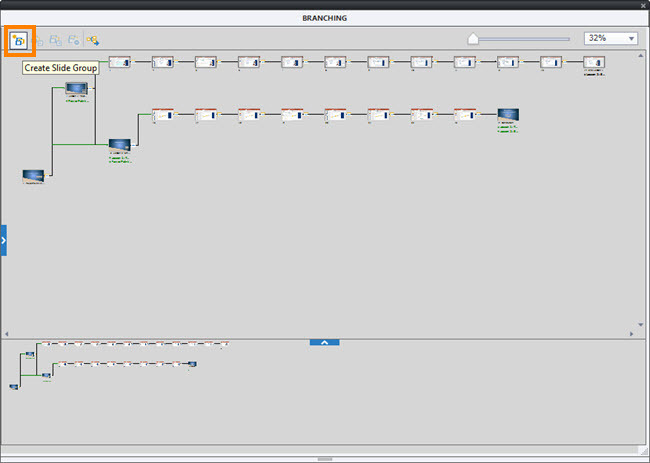 You can save the Branching View as a BMP, JPG, PNG, or GIF file by clicking Export Branching View at the upper left. Slide groups can be created by selecting the slides (click the first, Shift-click the last), then clicking Create Slide Group. The group can be named in the Properties Inspector. The Filmstrip will now show the group icons instead of the slide thumbnails. Each icon has an arrow for expanding or collapsing the group.